With 4.8 seconds left on the clock, RJ Barrett found himself isolated at the top of the key versus Josh Perkins. It was the Maui Invitational Championship, and the Duke Blue Devils were trailing the Gonzaga Bulldogs, 89-87. The unbeaten record of the hyped up Blue Devils was in danger of getting tarnished. That was until Barrett had a say on it. He made a quick crossover towards the right. Perkins didn’t bother to bite. With time winding down, Barrett went straight to the rim, with Rui Hachimura and Brandon Clarke ready to contest his shot. Both jumped, with hands up in the air. Barrett threw the ball up, in hopes of getting a foul call in the process. No whistle was blown, and the game was over. Gonzaga beat Duke. Twitter blew up. The Duke haters found a target in Barrett. They called the Canadian kid a ballhog for that costly play. It’s something that’s remained in the minds of both fans and haters since then. To make matters worse, Barrett was playing with the consensus top pick of the 2019 NBA Draft, Zion Williamson. 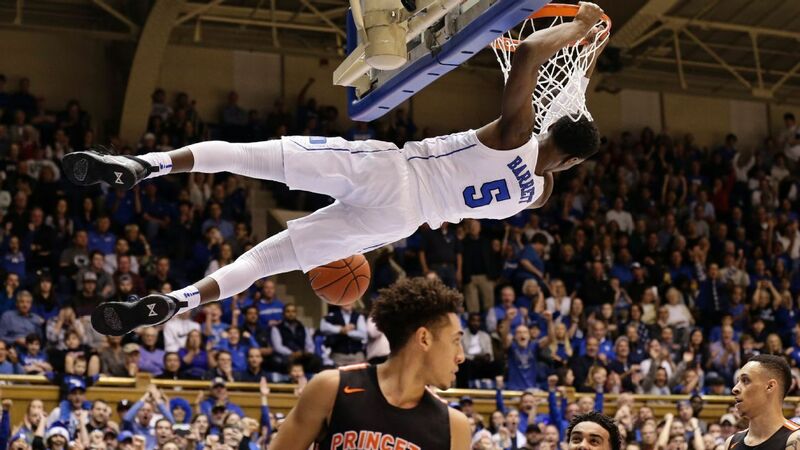 On the court, he has made Barrett look better because of his sheer gravity as an individual (33% 3FG with Zion vs. 19% 3FG without). However, off the court, when reputations and draft stocks are on the line, the same can’t be said when talking about the two Blue Devils. Think of Zion as an older brother to Barrett in this case. Williamson is much more highly regarded, and whether fairly or unfairly, Barrett is expected to live up to that bar. In the eyes of fans, he hasn’t. Zion is the consensus number one pick. Barrett is in danger of dropping out of the top two together, with Murray State’s Ja Morant starting to gain traction with his athleticism and upside. But just this once, take away the noise. Take away the comparisons to Williamson and Morant. Ignore the tags, social media posts, and preconceived notions surrounding the bluechip out of Montverde Academy. Just take a look at Barrett as a player and a case can be made that he’s a sure prospect coming into the draft. Barrett started to gain recognition as a top prospect after putting up 38 points, 13 rebounds, and five assists in a semifinal win versus Team USA in the 2017 FIBA U19 World Cup. Canada went on to win the Final versus Italy, with Barrett being recognized as the tournament’s top scorer, and Most Valuable Player once all was said and done. Scoring has always been Barrett’s biggest strength. Even with Williamson in the team, Barrett has been far and away Duke’s best scorer, averaging 23.3 points per game 46.3% field goal shooting. He’s called Maple Mamba for a reason. The scoring had never been a problem for Barrett. He’s always had the body, a tight handle, and aggressiveness that screams alpha dog. The main gripe with Barrett has been his decision making more than anything else. During the start of the season, he had a tendency to have tunnel vision, putting too much focus on the rim rather than the rest of the court. This led to a lot of forced shots and low percentage looks. But, a closer look at him from game-to-game will show that he’s overcome those struggles. With the Blue Devils, he’s emerged as the team’s second best playmaker, averaging 4.2 assists behind lead guard Tre Jones. As it is, Barrett is really a ball dominant wing. But as the season has gone by, he’s learned to stretch his game beyond his scoring. He already showed flashes of operating in the pick and roll during his run with Canada in the 2017 U19 World Cup. With Duke, Coach Mike Krzyzewski has made it a point to use Barrett as one of his primary ball handlers, and it’s worked for the most part. There are still ill-advised solo moments here and there, but they aren’t as prevalent as they were during the start of the season. That’s something haters will ignore. His growth. Barrett has improved, whether you like it or not. He may not be making highlights as much as his his more hyped teammate, but he’s added new tools to a skillset that already had him beat the U19 level’s best team. With 21.9 seconds left on the clock, Barrett was facing familiar territory once more. This time, he was isolated against Torry Johnson. It was Senior’s Night in Duke and the last game of Barrett in Cameron Indoor Stadium. 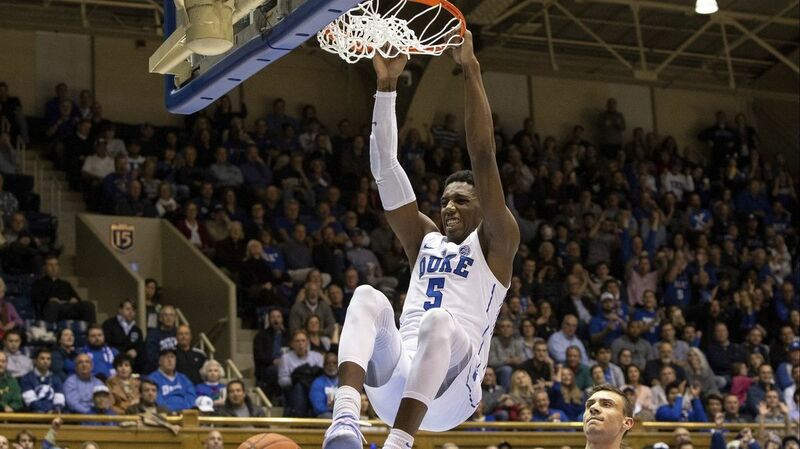 This time, the score read 69-68 favoring the Blue Devils versus the Wake Forest Demon Deacons. The game shouldn’t have been this close, but because of foul trouble by Cam Reddish and the rest of the Blue Devils struggling, Duke was in this predicament. They just needed one more shot to create some form of separation, and not leave their home court with a loss. Barrett could have elected to pass the ball to Jones, the team’s primary playmaker. This was deja vu, a throwback to Maui. With zero hesitation, Barrett drove towards his strong side, with two defenders on the rim once more ready to contest his shot. But he’s learned from his experience then. Instead of driving straight up in hopes of fishing a foul, he stopped, rose up, and attempted a layup with his weak hand. The defense did not see it coming. His teammates could only watch in awe. The ball rolled in the basket, and Barrett essentially clinched the game by giving the Blue Devils a three point lead. Zero hesitation. No regrets. Nothing will stop Barrett from working and playing his game.